I noticed that while my breaks where distracting, they were seldom refreshing. I would often return to my work feeling exactly as I had left. What do I want from a work break? As you can imagine, checking the news, twitter feeds, or Facebook, does not usually accomplish those things. Actually, sometimes you get the opposite effect. You feel worse, not better. As many of you know, I am a big advocate of business meditation. In my experience, meditation can make you a better entrepreneur and it’s a skill every entrepreneur should learn. As an experiment, I decided to add one more possible activity to my break options – a one-minute meditation. It could be longer, but a minute usually does the job. By the way, I don’t meditate at every break. Instead, I meditate for one minute during one or two of my breaks, and then I do something else. I have been doing one-minute work break meditations for only a couple of weeks. However, I am already seeing positive results. Meditation provides me with a clearer mind and more energy. But, above all, I have noticed that my productivity and my creativity have increased. Bottom line: a one-minute meditation break, once or twice a day, has improved my output and the quality of my work. I will update this post later, once I have more information from this experiment. But the results were good enough to deserve posting about it. First, you need a timer. I like the insight timer app since it’s also office-friendly. I set the volume to low, put the timer to one minute, and hit start. Put your arms on your lap or on the chair’s arm rest. If your mind slips away to work on a problem, gently direct it back to your breathing. Counting each breath helps keep your mind from wandering away. That is all there is to it. When the time is up, I do something else. 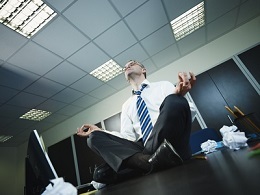 I would avoid meditating in your cubicle or open work space. Yes, it’s kind of sad that you keep meditation private, since it helps your productivity. But, unfortunately, this practice could be abused by people so I can understand companies that are wary about this. Obviously if your work requires you to be alert, a meditation work break is not for you. By the way, taking a one-minute meditation break is much harder than you think. It will be a bumpy road and you won’t meditate every day. At least, I haven’t. There is always something pulling your attention – work, a phone call, twitter, and Facebook. Fighting against these habits – because checking Facebook regularly is a habit – is difficult. I often “forget” to take the break simply because I don’t have the time. But when I do take the break, I am glad I did and can see positive and immediate results. Just do your best and try to squeeze in two meditations per day – that is two minutes. One in the morning and one in the afternoon.